I can't believe we will actually be meeting our sweet girl in just a few days! It's SO surreal and we couldn't be more excited/anxious/nervous/ALL of the above! As promised, I wanted to share what I packed in my bag for the hospital! When we had London, I made it a point not to overpack and was pleasantly surprised because I felt like the hospital really had a lot that we needed. Now I'm going to list the things that I brought in my own bag ... which is actually a small tote from Target. - Comfortable/roomy "going home" outfit; I opted for this Daisy Cami Maxi from Forever 21 that is loose fitting because let's be honest, you're not going to feel your absolute best! I totally suggest making a small list of things you can't forget but also can't pack until you're just about to leave for the hospital! For me this was: phone, phone charger, toiletries, make up bag, and pillow! I strongly advise against overpacking. You'll have enough to worry about, but packing the car with 5 large bags shouldn't be one of them! I think if you want to bring a diaper bag, great - but if you can fit the baby's stuff with your stuff, that's fine too! I hope this helped any parents-to-be! I'll make sure to post some updates / baby Markwood's birth story soon! If you want to follow along even closer, check my Instagram stories! 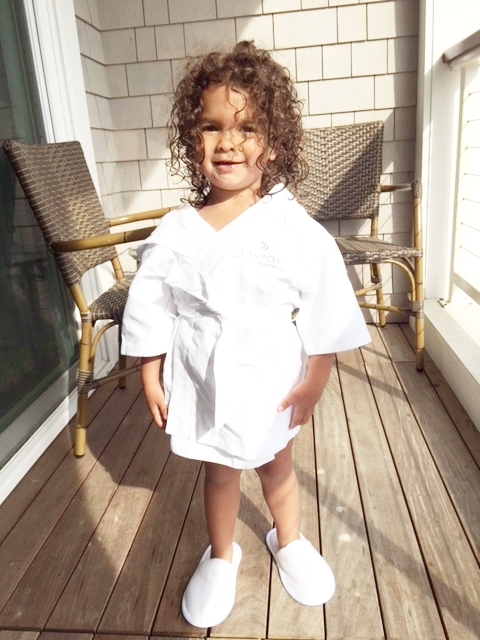 Last weekend I whisked Chris and London off for a little getaway at the Beauport Hotel! 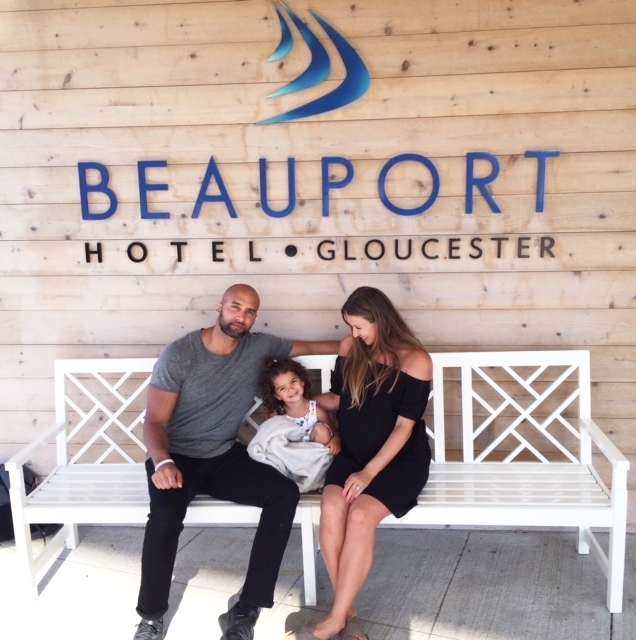 We had been to Gloucester a few times to enjoy the beautiful beaches, but never had the privilege of staying at the Beauport and you guys, it's AMAZING. I feel like it's somewhat of a hidden gem in that it's only a few years old and the proximity to Boston is perfect (it only took us about 45 minutes!) 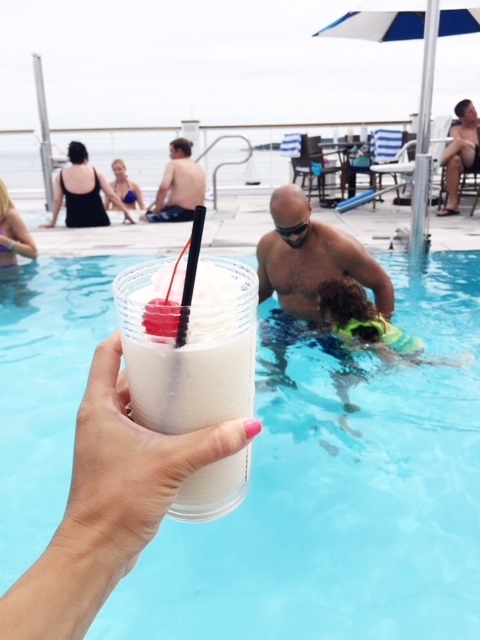 The rooftop pool, delicious food and sweeping ocean views coupled with the standout service and amenities made this weekend one of the best family getaways we've had to date! I'm so excited to share the details with you all! We had the privilege of staying in one of the Beauport's oceanfront rooms and it was absolutely stunning. Our balcony overlooked the Atlantic ocean and we enjoyed the most beautiful sunset in the evening. Our room was really spacious, as was the bathroom, and had somewhat of a nautical vibe! The hotel provided bathrobes and slippers (even a pint-size robe for London - which was WAY too adorable) and the bath products were my favorite, L'Occitane. Housekeeping did a fabulous job of making sure the rooms were spotless and we loved the chocolate they left after turn-down service! We all slept so well in the plush queen sized beds and even though London was awake at 6:30AM, I was actually excited! I brewed a cup of Green Mountain coffee, which was provided in the room, and drank a cup while listening to the crashing waves. It was the most relaxing way to ease into the morning! One thing I really wanted to mention about the Beauport is their service! Everyone was so warm and friendly to us during our stay. They were very sweet to London and went out of their way to make us feel welcome! The servers at the pool and the restaurant were extra attentive and even the bellman we asked to snap a family photo was enthusiastic! I can't say enough about the staff + how wonderful they were. The amenities at the Beauport are a 10 out of 10! We were so impressed at every turn. First of all, complimentary valet parking...HELLO! I felt like there was such attention to detail and all hands were on deck when guests arrived. Our luggage was taken directly to our room while we went to check in so we didn't have to worry about a thing! We immediately made our way to the rooftop pool because London was bursting with excitement about going swimming. I'm not going to lie, when we stepped onto the pool deck the panoramic ocean views kind of took my breath away! I was worried we would be a little out of place with our 3-year old in tow, but was pleasantly surprised to see a handful of other kids there as well; it felt super family-friendly. The bar/tapas service at the pool was an added bonus! I enjoyed a (virgin) pina colada; a yummy way to cool down from the hot sun! There's also a jetted hot tub on the roof deck which was super relaxing! 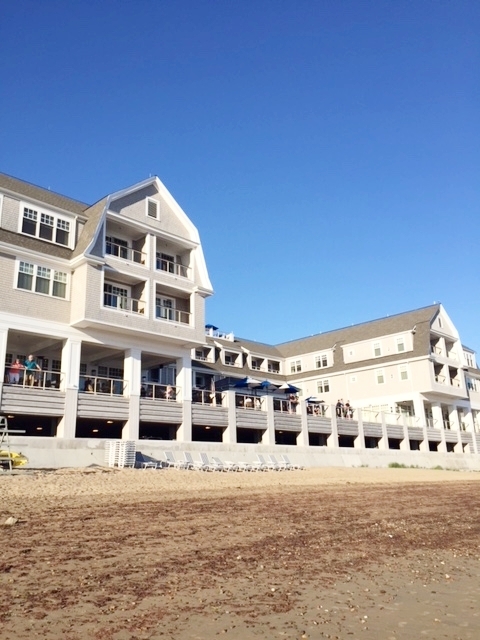 Not only is there a pool, but you can step out the door and right onto Pavilion Beach where complimentary beach chairs are provided as well as paddleboard rentals and service from the Beauport Beach Attendants! If you're one that can't miss a workout, there's an excellent fitness center that opens bright and early at 5AM. Ok, in addition to the rockstar amenities - the food at the Beauport was REALLY impressive. I think overall Chris and I are somewhat picky - mostly because Boston has such an incredible food scene - but we were pleased with all three meals we had during our stay! To start, the staff brought a bottle of wine and a cheese/cracker + fruit board to our room as a little surprise. It was so sweet and not to mention, delicious! The1606 Restaurant, where we enjoyed dinner, breakfast, and lunch the next day is right on site and has an amazing oceanfront dining deck. I won't bore you with every detail of every meal BUT I will say, the portion sizes for all of the dishes we ordered were generous! I ordered the lobster roll for dinner and it was loaded with chunks of yummy lobster meat! I also really enjoyed their breakfast options as well. The fruit was very fresh and the waffle served with warm maple syrup made my pregnant dreams come true! It definitely exceeded our expectations! I honestly could go on for pages about all of the things we loved about our stay! Chris and I just kept looking at each other going "this is awesome" and talking about how we can't wait to go back. I loved sharing it on social media too and seeing all of your DM's asking me about the hotel! I'd love to hear from you in the comments below if you have stayed at The Beauport before or if you have plans on going! Anxious to hear what you think! I can't believe I'm already at the time in my pregnancy when my OBGYN appointments are just two weeks apart! For some reason, knowing that just makes it all seem like it's going to go even faster! We are moving at the end of this month; so I'm hoping baby girl doesn't decide to come crazy early...mama needs some prep/nesting time :) I'm happy to report that my sciatic nerve pain is almost completely gone! I'm guessing the baby's position changed because I don't think it would have subsided otherwise! I was going to the chiropractor, icing, backing off from any sort of physical exercise and it was still bothering me at some points...so it had to be position! Either way, I'll gladly take it. I feel SO much better now that I'm not dealing with that. I still have a crazy amount of pelvic pressure but usually with some elevating of the feet and a little ice...I can manage that well. I have totally noticed more veins popping up this second pregnancy! By the end of the day if I've been on my feet (which I usually have been with a toddler), my leg veins are kind of swollen. Eeek! I'm praying they don't start popping out completely! Now that I've hit the 33-week mark in my pregnancy, I'm starting to have some Braxton Hicks. I notice them more after I take a walk with Lo or at the end of the day. At my last appointment, the doctor checked to see if everything was ok and thankfully it was (aka cervix is closed!) Thank goodness! I was certain they were just Braxton Hicks and not the real deal because I started using my Bloomlife monitor! It's the world's first clinically validated wearable contraction monitor that detects all uterine activity, so I could see that my contractions were far too irregular to be labor contractions. I SO wish I had one during my first pregnancy! I feel like it would totally have given me more peace of mind and confidence when determining what my body was experiencing! The Bloomlife tracker comes with three parts; the app, a sensor and a reusable patch you can take on and off your body for up to a week. If you run low on patches more will be shipped to you at no cost! Another REALLY cool thing about the monitors is that you RENT them on a week-to-week basis. You can use it until the baby is born and then just pop it in the mail to return it when you're done! I started using mine this week and I’m definitely going to be using it until baby girl is born. I typically wear it at night after I put London to bed and I’m finally resting on the couch. I think it’s also nice for your partner to feel like they have a clue as to what’s going on with your body! When the contractions do start, both you AND your partner can see what's going on and it will put everyone's mind at ease. If you’re interested in trying your own Bloomlife monitor, you can get 10% off using the code: AM10! If you’ve already tried it, let me know your thoughts in the comments below! Thanks for stopping by! It's taken me awhile to start this letter because every time I try, I get so emotional! I hope one day you read this, and you can feel my heart. Right now you're sleeping...and I've got the monitor next to me like I always do so I can peek at you periodically because I just love watching my little angel sleep. You are my first born. The "chapter one" in my motherhood story and what a beautiful story it's been thus far. You completely changed my world that night three years ago and nothing will ever compare to the feeling I had pulling you up to my chest, all 6 pounds 12 ounces of you, holding you for the first time with tears welling up in my eyes. In that moment time stood still and it was just "us" ... Mommy, Daddy, and London Grace. I had absolutely no idea what was in store, but I'll never forget how overwhelmed I was with love and how instantly I felt so honored to call you "ours." If only I'd known then how fleeting every moment after that would be. 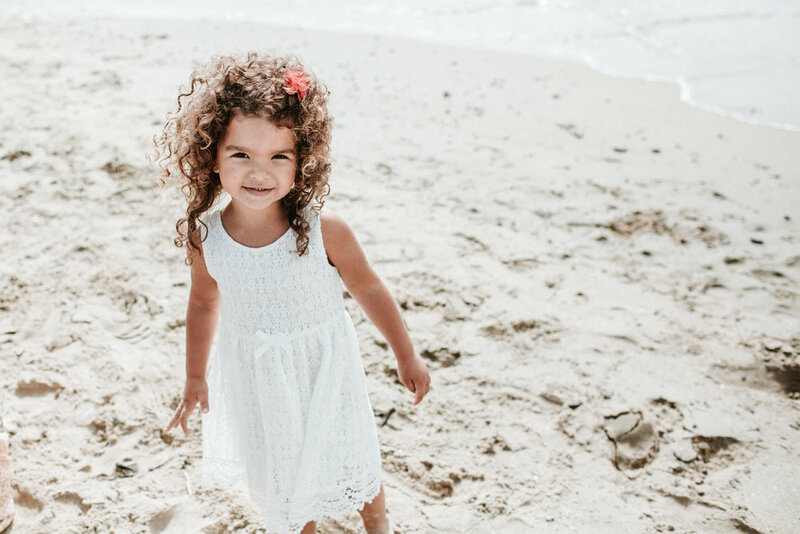 How quickly you'd go from that 6-pound bundle to my sweet, independent, bold, beautiful, and sometimes sassy baby girl soon heading off to preschool. You've grown so fast and while I feel so incredibly lucky to watch every part of that, it hurts my heart a bit. The truth is, I already miss "us." I've had days (a lot of them) where I find myself in tears...almost mourning the time spent where it's just Mommy + Lolo. Because whether we're adventuring to the beach, having a Starbucks date or just taking a walk to the playground - we always have the BEST time together. That doesn't mean it's always been easy. You are my first born after all, and with that has come a lot of trial and error. I've probably done too much worrying, stressed a little too much, and shed too many tears about things that don't matter much in the end. I have days where I feel worn down and like I am failing in so many areas as a mom, but your beautiful, loving soul always brings me back down to Earth. Your infectious personality and smile reminds me that while I'm far from perfect, I must be doing something right. Thank you for that. Soon, daily life for us will look a little bit different. It won't be just the three of us, and you will have to share mommy more. I want you to know that God knew I needed you first. That's the thing about God...He always gives us exactly what we need and He's the ultimate gift-giver. YOU are His ultimate gift to us and everything I ever imagined. This transition may seem a bit scary and overwhelming for both of us, but it gives me so much joy when I envision the ways our family is going to grow in even more love and happiness. I can picture you as a brave big girl ... eager to show and teach your little sister everything along the journey of life. She is the luckiest to have you. No matter how much our world changes, you will forever be my first child; the one who taught me the truest meaning of unconditional love, pride, happiness, and even heartache too. I love you from the depths of my soul...forever and ever, my sweet girl. I can't even believe I'm 30 weeks now! Ahh!! It just doesn't seem real! I know these next weeks are going to FLY and before we know it we'll be adjusting to life with two babies. I'm feeling anxious and excited. We are also moving in a month so that's taking a lot of thought + planning as well. I'm really looking forward to getting settled in our new space and "nesting" a bit before baby comes. When I was 9 months pregnant with Lo we moved and I really enjoyed the process - to decorate and paint, etc. If there's one thing I HIGHLY recommend doing is taking advantage of a little thing called the "Baby-moon!" Someone along the way came up with this excuse for a getaway and I'm their biggest fan. Chris and I went away for four nights before Lo arrived and it was such a wonderful time to relax, unwind and just enjoy each other before baby. Fast forward 3(ish) years...we're due with our second and the idea of a babymoon sounds even more incredible now that we're parents and crave one-on-one time together! Chris is currently planning our getaway and it's a total surprise to me :) I don't know where or when we are going...I just know we're going! Ahh!! I'm so excited to escape with him and mostly to sleep in (oh, the little things :) Anyway, it got me really into doing this post for anyone who is also planning their own babymoon! Here are some cute style must-haves and essentials to make your getaway all you dream it will be AND MORE! Anyway, that was kind of a "life" update and here's the bump-date: I'm feeling OK. Ha, I will elaborate, but..I don't feel AMAZING and I don't feel terrible...just meh. I will definitely say (as I have shared previously) this pregnancy is MUCH different than the last. With Lo, once I hit 10 weeks I had a bunch of energy and physically I felt great...not pain, pressure, back aches, etc. Baby number two came in a bit HOT, for lack of a better term ;) I find myself getting winded and out of breath much quicker, needing to take more frequent breaks, and icing my back whenever I get the chance! The pressure is also much more intense this time around..which is less than fun. The good news is...the icing totally helps AND I've started seeing a chiropractor which I feel is helping with the sciatic pain. I'm still sleeping well - so that's also really good and I'll take it as long as I can! I'm working on a post about baby registry "must haves" and I should have it up next week! I'm so excited to share the things that I LOVED and couldn't live without when we had London ... and also a few new things that mommy's have suggested I get this time around! Thank you for following our journey - I always love the support! I can't believe it's Easter week already! 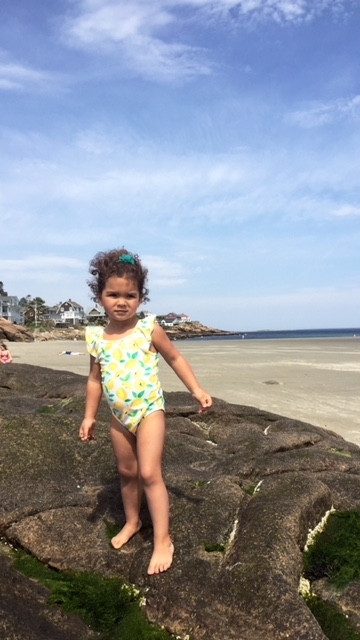 It's one of my favorite holidays to celebrate and especially fun now that we have a little one who LOVES eating treats and finding eggs with her cousins :) We are spending Easter weekend in Maine this year after staying home the past few and we are so excited to be with family. I wanted to share some Easter traditions that we love that maybe you can adopt and pass on to your own family! I'll also share some basket ideas / things the "Easter Bunny" aka YOU can leave on Easter morning! 2. Brunch. Hello Hot cross buns! Before or after service is the perfect time to have something out for the family to munch on! It doesn't have to be anything crazy; coffee, juice, pastries and a quiche and you're good to go! Hot cross buns are an Easter staple and if you want a good recipe, you can find it here! 3. Egg Hunt. This is a MUST! London was a beast last year during the egg hunt with her friends - she had her eye on the prize ;) I'm sure this year will be even better and I can't wait to watch her scurry around. We filled her eggs with some of her favorite things (not all candy) like yogurt bites, fruit loops, and raisins and she was so excited. Of course, we snuck a few m&ms in there as well! We got a little Easter egg hunt kit from Target last year - but this would also be cute to mark the start of the hunt! 4. Dyeing Eggs. We didn't do this last year but plan to this time around! I always loved doing this as a kid - and I think London will too! You can find kits anywhere...Target, Walmart, Rite Aid, CVS etc., and they're pretty cheap! It's an inexpensive way to have fun and do a little Easter holiday project! 5. Easter Baskets. My fave! I LOVE playing Easter Bunny ;) It's so fun and now that the Target dollar bin exists, it's even more exciting! Amen?! The things they have are so cute. Don't feel like you have to fill the baskets with just candy and junk food! There are so many other ideas like books, stickers, etc that your little ones will be just as excited about! Those are a few ideas that you can use for your own Easter celebration this year! I hope you have a wonderful holiday with your friends and families...wherever you may be! Thank you for stopping by! We have had QUITE a week which started out with the news that we are adding another GIRL to our little family of three! We are so super excited...and knowing the gender just makes everything that much more real! I flew solo to Charleston, SC to watch my husbands college basketball tournament. I saw one game, flew back to Boston, watched the semi-final game on TV (which they also won) and ended up booking last minute flights for myself and London to go BACK to Charleston for the championship game! It was a little bit INSANE, but totally worth it. London had the BEST time and even though my husband's team fell short, it was an amazing experience. Traveling with her is just so much fun and she brightened up a pretty miserable day. Now back to the pregnancy! We are 20 weeks already...and as the title of this post says...HALFWAY TO WINE! It's so interesting that I never craved wine when pregnant with Lo but this time around - I would LOVE to have a vat of pinot noir. I kind of thought I was carrying a boy because of how different this pregnancy has been from my first. I STILL have bouts of nausea (which I'm so over) and with London I felt great by 10 weeks. So that alone has been much different! My food cravings are a little bit insane as well. I was ALL THE GREASY foods; french fries, cheeseburgers, chicken nuggets, etc! I crave sweets at an all time high too! It's really difficult to ward them off and I try my hardest to make good decisions but sometimes the craving wins out! I do feel like I was much more active during my first pregnancy. Of course, I'm busy chasing a toddler around - but I haven't made time for the gym and have been squeezing in a few workouts here and there at home. I'm hoping that can pick up once the weather gets warmer and we have a chance to get outside for walks! Our next appointment is in a few weeks but from here on out they are just quick ones with our doctor. I can't believe we won't have another ultrasound and the next time we see baby girl will be when she's placed in our arms! Ahhh! This pregnancy is going by so quickly - so much so that in just FOUR months we will be ready to welcome her home! That's just wild to me. I need time to slow down a bit. I've been thinking a lot about what having another child means for London. Of course, I know she will love her sister and we are giving her the best gift, but I also know that there will be A LOT of things going on in her little brain and I just worry about it. I'm sure that's normal for all parents who are about to add another baby to their families. I'm working on a post that's pretty near to my heart - a letter so to speak to my "firstborn" and I'm having a hard time getting through it! It makes me really emotional. I can now understand why parents have such a special place in their hearts for their first child. My mom tried to explain it to me once, and I couldn't understand ... probably because I was their third ;) ...but now I get it. They're the baby that makes you a mom...that opens your heart to a love you never knew existed...and you experience every "first" with them. Needless to say, there are a LOT of emotions we are feeling and I'm sure that rollercoaster will continue for the next few months - until baby arrives! Thank you all for following our journey! It's been so much fun to share and document it along the way! AHHH!!! WE ARE SO THRILLED and EXCITED to share this news! We are adding another little princess to our family and it still feels like we are in a dream! We found out yesterday morning and it's already INSTANTLY felt more real! I love being able to refer to the baby as "she" or "her!" Picturing London with a little sister gives me ALL the feels and makes me so happy. I have the most incredible relationship with my own sister, who is my very best friend, and I just can't wait to watch the two of them form their own beautiful bond! Here are a few photos from yesterday, when we found out! Also - I'll share more details soon about names we love, how we told London, and if I feel like our family is complete, etc! Lo and I recently took a trip to Walt Disney World with my parents and had the BEST time! Seriously, traveling with Lo is so much fun. Some of you might read that and think I'm crazy - but she thinks everything is the COOLEST and that makes it so enjoyable. She loves being at the airport, going through security (wonder how long that'll last), getting on the airplane...just the whole experience in general. This was the third time we have taken her to Florida and each time gets better and better. 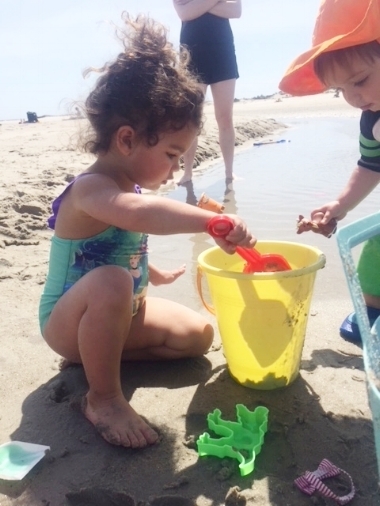 We had such a smooth trip, that I wanted to share some "must haves" when it comes to toddler travel. I know it can be stressful at times, I get it; but I think if you try to make it as fun as possible than they will feed off of that energy. First things first...I highly recommend traveling with a BACK PACK as a carry-on. Just trust me on this. You need two hands (and sometimes three). I really love this one from Skip Hop (this one is a close second and less expensive) because it has so many compartments. 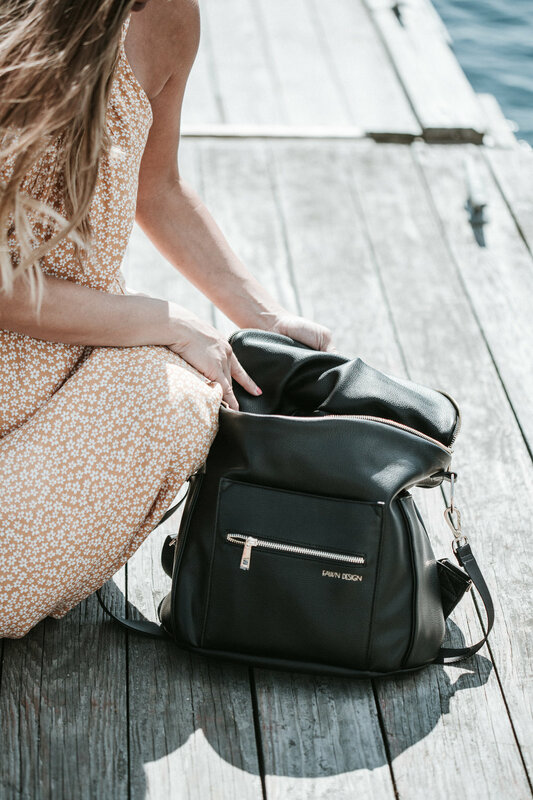 If you're looking for a bag you can use every day, Anchored East makes a great one for under $50! This airplane experience was one of the best with London. I timed both flights to be during her nap so she would at least sleep for some of it and we managed to get her to sleep for an hour each way – which was a win! For the rest of the time we relied on snacks, books, plane-friendly games/toys, and of course – the iPad. Lo is old enough to understand how headphones work and she LOVED wearing them. We found these $18 volume-limited kids headphones on Amazon and they were perfect! I also snagged this iPad Kids Case which made it much easier for London to hold. One more tip: I highly suggest bringing a travel pack of Purell sanitzing wipes. It gives me peace of mind to wipe down the germ-infested airplane. I also bought the travel-sized Purell that you can attach to the strap of your backpack. Can't tell you how many times we used this throughout the day at the airport and at Disney! This isn't a travel tip, BUT I've gotten so many questions about this swimsuit so I thought I would share! I really love it for the price ($16.99) I mean, you can't beat it! I wanted an inexpensive swimsuit that I could wear to match London, without too many straps (no tan lines!) I think the color is perfect and the best part is, it comes in black also - which I think I might have to get for summer! I definitely suggest sizing UP! I ordered a medium for my growing, pregnant body - and I'm really happy with the fit. I hope you guys found this post useful for your future travel adventures :) Thank you for stopping by and have a great week! Last weekend I got a chance to spend quality time with some of my favorite mamas sans-kids for a fun "Moms Day Out" experience! 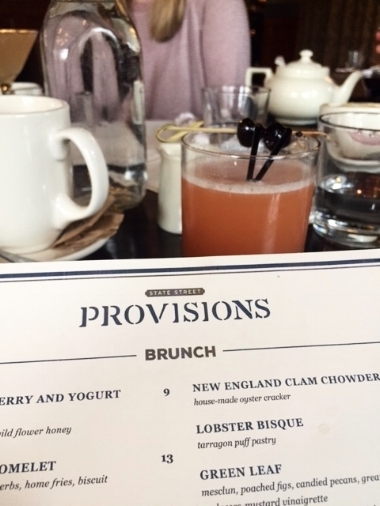 We spent the morning/early afternoon together - enjoying an amazing Core Cycle class at Exhale Boston Battery Wharf and then headed over for a fun brunch at State Street Provisions! It was the perfect Boston day that was MUCH needed for all of us! Exhale has a GORGEOUS space and spa. I had been to the location in the Back Bay, but really loved the fact that this was part of Battery Wharf Hotel oh, and the valet parking (which you can get validated at the gym). We took the new Core Cycle class and it was amazing! I haven't done a spin class in months, so it felt great to sweat it out for 45 heart-pumping minutes. Our instructor Erin was super motivating and once she shut the lights off and cranked up the music the energy was electric! We were all dripping sweat, but it felt awesome. We also got SO many compliments on our matching shirts from Jam Threads (which you can see above!) It was a cute little touch that just made our day even that much more fun! Also, not only are they super cute but the material is so soft; all of the ladies said the same thing! Cute + comfy, for the win! After class, we were able to take advantage of the beautiful deluxe full-service spa that Exhale has to offer! They provide you with plush bath robes and comfortable slides, and even if you're not booked for a service you're able to use their sauna, detoxifying hammam, the "quiet spa lounge," and rain showers (complete with heated towel racks!) I think the calming zen lounge was super appealing to us mama's, since we all have toddlers :) We enjoyed sipping tea, lemon-infused water and just looking at magazines. A few of the girls LOVED the sauna, which I sadly had to skip because...pregnant! I did take the longest, most luxurious shower I've had in awhile, using the shampoo/conditioner and body wash provided! There are lots of other amenities too such as body butter, hair spray, hair dryers and even mini straighteners to use if needed! We spent over an hour just relaxing and it was incredible. We will definitely be back to enjoy another class/spa experience soon! After an intense workout, we were so ready for our yummy brunch at State Street Provisions! 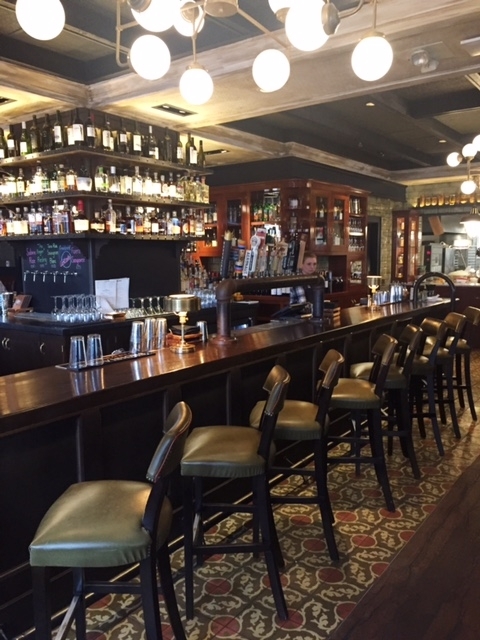 The restaurant has a chill vibe and also a large fully-stocked bar! They made me the yummiest "mocktail" and the other girls loved their hand-crafted drinks. The brunch menu is super diverse and it took us quite awhile to decide what we wanted because EVERYTHING sounded so good! I highly recommend the burger served on an english muffin; it was absolutely delicious! We were also surprised with a little dessert from the chef - a cappuccino mousse with orange and almond biscotti. It was the perfect ending to our meal...I think we nearly licked the plate clean :) Not only is the food incredible, but the location is perfect! It's right around the corner from the New England Aquarium, across the street from Faneuil Hall, and walking distance to TD Garden! 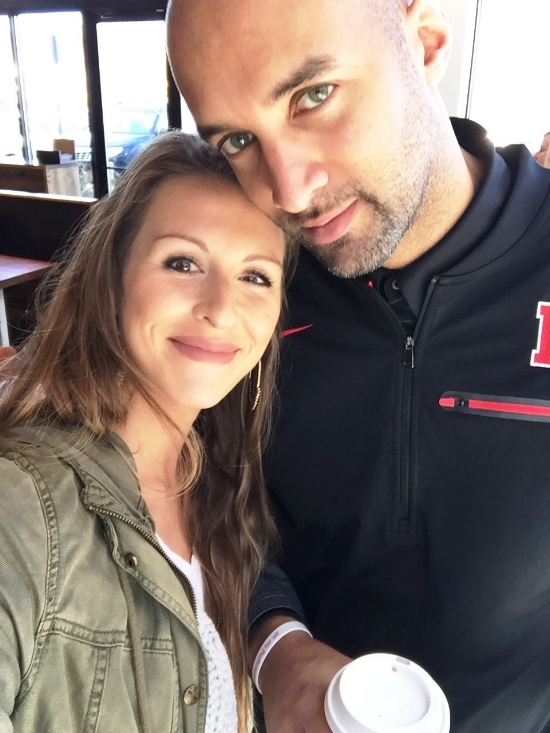 We had such a refreshing day hanging out in our city and enjoying some "kid-free" mommy time! What are some things that make you feel refreshed?! Special thanks to Jam Threads, Exhale, and State Street Provisions to helping to make this day so much fun! I'm currently writing this post from warm + sunny Florida! We are so excited to be here for the week, taking on Disney with London once again. She's in HEAVEN (so is Mommy) and it's just so much fun to make more memories here with her. My parents are also along for the trip, which is really fun too! Overall, I'm feeling pretty good! I'm SO happy to have my energy back. The nausea is still sometimes there - which is less than fun - but I think I've just learned to live with it! I will say, I'm finally noticing my bump starting to poke out! Yay! I have been waiting for it! 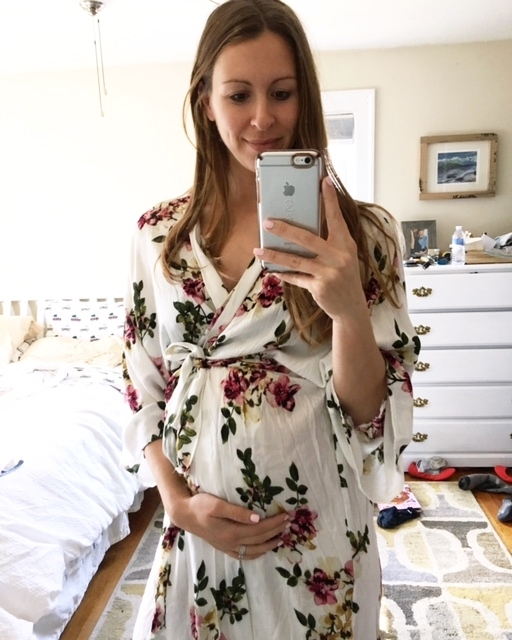 Chris has been telling me for the past few weeks that I'm "pushing out" but I think now we've determined that it is in fact, the baby :) I think it can be difficult at the beginning to embrace all of the changes happening to your body - but I just try to remember how amazing it all is. The fact that our bodies can do this is such a miracle. Speaking of changes, I'm starting to be a bit uncomfortable when I sleep. I am such a stomach sleeper - but now I can't lie flat without it feeling weird! It may be almost time to break out the snoogle pillow - which saved my life when I was pregnant with Lo. Seems a bit early this time around, but I've heard second time is different! My skin has been REALLY dry and itchy - which know is also a "thing" during pregnancy so I've been using the Mama Mio tummy rub before I go to bed and when I wake up. I'm noticing a huge difference. The body butter is really thick (which I love), has a Shea butter base and smells delicious like mint. So far so good! Cravings haven't really changed too much - I still want lots of orange juice and fruit, but I also crave a burger and fries too. I like to say it's a nice balance ;) I try to keep almonds or some sort of trail mix snack around to munch on because I am hungry all the time. At least I don't get nauseous if I don't eat every half hour like during the first trimester! It's toned down a bit! I've also been having oatmeal as a mid-afternoon snack/meal. It helps to keep me full a little longer so I can make it to dinner time without feeling "hangry." 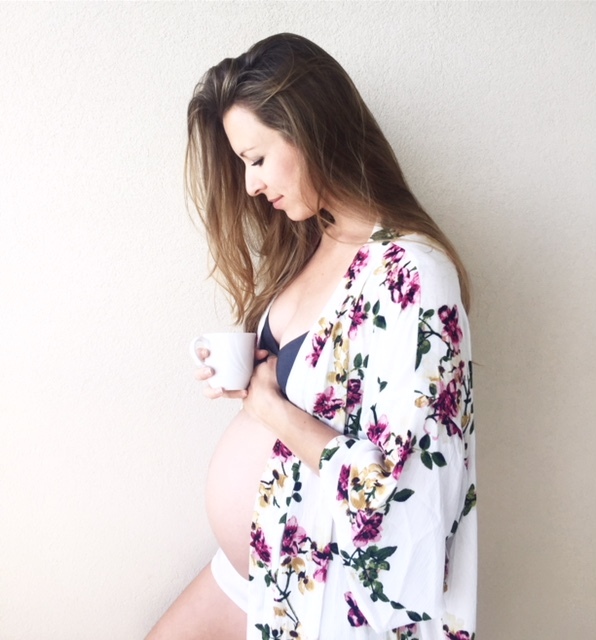 I'll keep these little "bumpdates" coming - because it's a fun way for me to share the pregnancy with you all. I'm so thankful for the journey and that I get to occupy this little blog space! It's so fun and makes it extra exciting for us! Thank you for following along! 1. Schedule character "meet and greets" ahead of time (see above). Pay the extra money and BOOK IN ADVANCE for a character dinner or breakfast. The characters will come to your table while you eat ... it's definitely worth the money. If you book the character meet and greets at the park ahead of time using your Fast Passes, you should be all set too! 2. 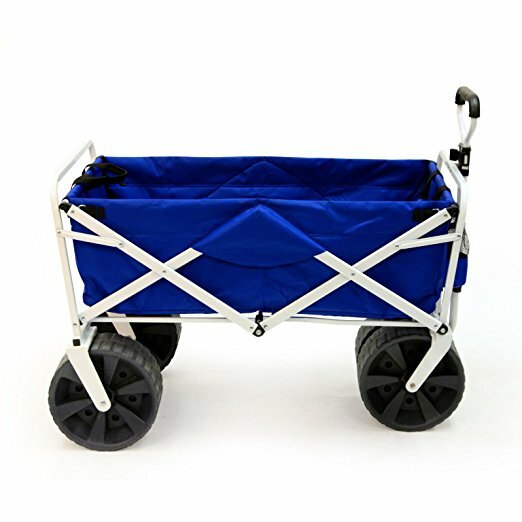 Invest in a good, "easy to use" stroller. We used the BABYZEN YOYO+ and it was amazing! It's so easy to unfold and fold (you can do it with one hand) and also fits in the airplane's overhead bin. It comes with a shoulder strap so you can carry it just like a purse, and weighs just 15 lbs. I also love that while it's super compact, it has a great storage area underneath. Oh, and did I mention it comes with a rain cover?! It's basically the perfect travel stroller, and you can check it out here. 4. Bring a backpack as your diaper bag. Trust me on this one, you need all hands on deck not to mention a million snacks, sunscreen, water, your phone, wallet, etc., so you'll need lots of compartments! 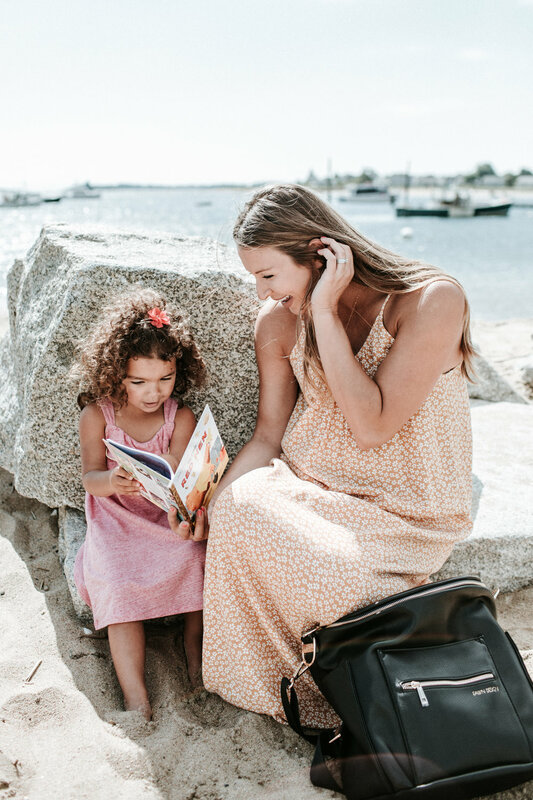 We love our Skip Hop Chelsea bag, and Skip Hop also makes a pretty awesome backpack for under $60! I also love this one from CoolBell too because it's super functional and has an insulated front pocket to keep a bottle or snacks cool! 5. Plan Fast Passes in advance. Have a plan of which rides you want to hit and do your fast passes online in advance so you don't have to waste time trying to figure it out at the park. We made the mistake of waiting to figure out the fast passes once we got to the park and by the time we did, a lot of the rides we wanted to hit were booked up and the wait was insane. The second and third days we planned the night before and it was MUCH smoother. 6. Bring snacks/lots of fluids. One thing I appreciate, is that Disney allows you to bring your own snacks AND water into the park. (Also, if you pay the extra for preferred parking, they'll give you cold bottles of water before you park the car, which is nice to know!) I brought lots of options for Lo in separate snack bags like grapes, goldfish, harvest snap peas, yogurt bites, apple sauce pouches, and raisins. If you're planning a 3-day Disney trip, I recommend two full days at Magic Kingdom and one at the Animal Kingdom. If you've got 4 days, go with 2 full MK, 1 day at AK, and 1 day at Hollywood Studios. If you're going for a toddler-based trip, I'd choose Hollywood Studios because they have SO many amazing rides and shows for kids (Beauty and the Beast, Frozen, Toy Story, etc.) We didn't get a chance to go, but definitely will on our next trip! Magic Kingdom: It's a Small World, Peter Pan, Under the Sea; Country Bear Jamboree, Swiss Family Robinson Tree House, Pirates of the Caribbean, Jungle Cruise; There are also shows running every few hours or so on the stage in front of the castle. We caught one in the afternoon which included Mickey, Minnie, Donald, Daisy, Goofy, and the Frozen characters! Being that I'm a stay at home mommy to London, I think it's so important that I integrate classes in our schedule so that she can be around other children her age! It's also fun to try new things with her and I always seem to meet some pretty fantastic mama's I can relate to as well. We've been taking a music class together since she was 6 months old, but I also wanted to do something active - especially during these cold winter months - to burn off some of that toddler energy! I began researching places in the Greater Boston area and stumbled upon Coolidge Corner Yoga in Brookline! I was so excited when I found that they offered a "Toddler Yoga" class for children up to 3.5 years old. London is super energetic and I like to be active too - so I thought this sounded like something fun to try together...and it was! Our teacher, Joanne was super laid back, patient, and engaging (all great qualities to have when dealing with a bunch of toddlers!) The "hello song" that kicked off every class was one that all of the kids seem to enjoy; "Om, London, celebrate London, sing it with an open and a joyful heart..." What a wonderful message - I just loved it and around week 5, London started singing it at home to all of her stuffed animals. Super cute! 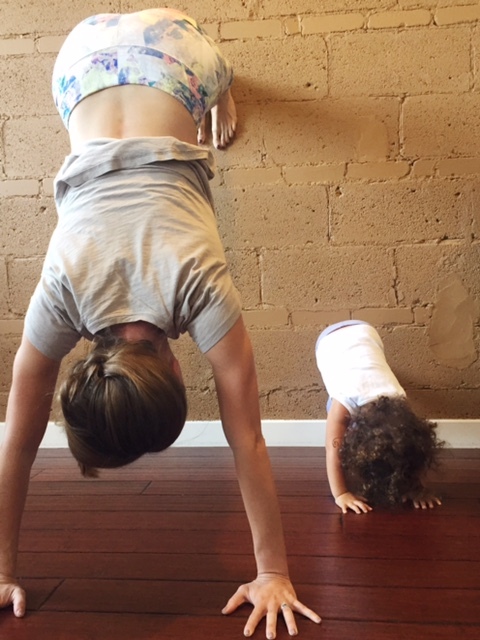 Joanne led us through some really fun partner poses that we could try with our little ones. Sometimes Lo was really into trying and sometimes she just wanted to run around the room - which was totally fine too! Either way, we were reaping the benefits; I was getting a stretch in and London was burning energy. Also, even though she was running around the room, I knew that she was still listening and observing which is still a win! 3. The cool down. I think this might have been London's absolute favorite part. With the lights dim and the soft music playing, Lo would lie on her mat and ask me to rub her back. She waited patiently for Miss Joanne to come around and rub lotion on her feet. She would be offered strawberry or banana scented lotion (sometimes chocolate) and London would always say "I'd like strawberry AND banana lotion." I thought this was super cute and unique way to calm the kids down and also such a good sensory exercise that they all really loved. I would highly recommend trying this class if you live in the Boston area! It will certainly nourish your child's budding imagination and will be lots of fun for him/her! There are also classes offered for children in other age groups as well and you can learn more about those here. It's worth mentioning that CCY has a sister-studio, Sadhana, in the South End neighborhood of Boston so totally check that out if geographically that makes more sense for your family. They also offer classes suitable for the whole family! As always, if you have any questions about the class - please leave them in the comments below and I'd be happy to answer! Thanks for stopping by!